Sometimes the finest dining a country has to offer isn't in a Michelin-starred restaurant -- it's within a few feet of spinning Michelin tires. Street food is the true fuel of the people, and there's no better way to get to know a country's cuisine than by hitting up a food stall and digging into a home-style meal. With a combination of personal experience, advice from experienced travelers, and research on cultural food traditions, we've put together a ranking of the 16 best street-food cities in the world. And while basically every major city in Southeast Asia had a shot at being No. 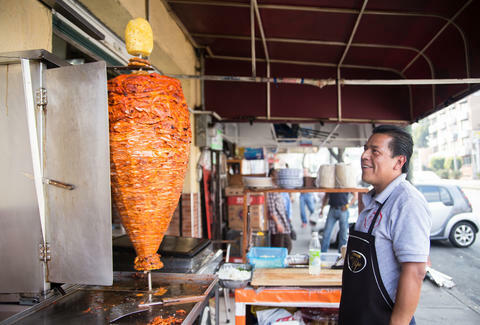 1, read on to find out whether the city that serves tacos, dumplings, or grilled cow udders is the king of the street-food world. This walled South American treasure has one of the fresher street-food scenes on this list. Juice, fruit, and macheted coconuts are everywhere, as are little plastic cups of sugary Colombian coffee. Ceviche and shrimp cocktails remind you that you're on the coast, and arepas and empanadas have the savory pastry game on lock; for the gluttons, they deep-fry everything from cheese to pig feet. Although it's all delicious, Cartagena's place on this list would rise if they had more variety and ways to distinguish themselves from the rest of South America. 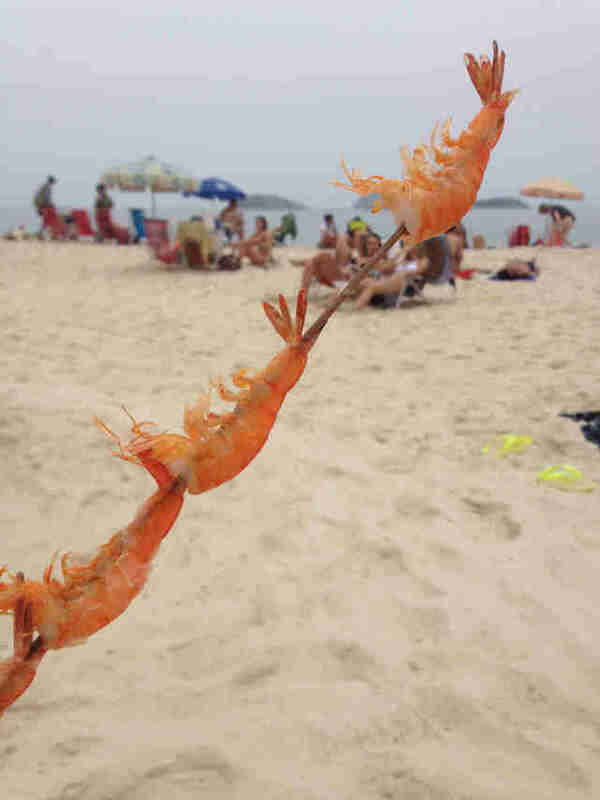 Eating in Brazil can be surprisingly expensive, but luckily street food comes to the rescue. Brazil's most sleeper snack is pão de queijo, warm little balls of cheese bread that are found just about everywhere. The city revolves around the beach, so naturally there'd be some killer eats along the waterfront. Vendors pace along the beach screaming out their offerings, which range from skewered shrimp, to savory fried pastel pastries, to hunks of cheese roasted to order on tiny grills. 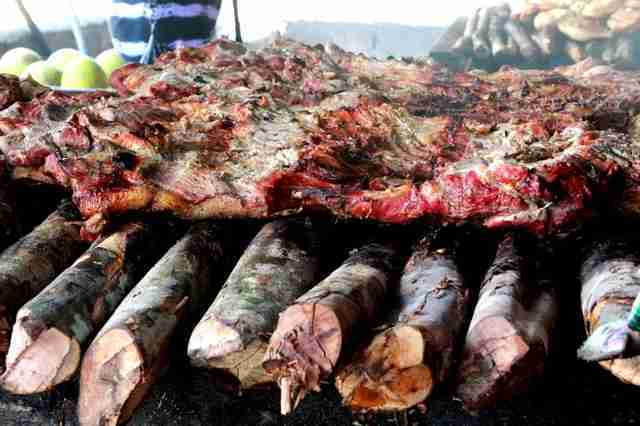 If you've ever been to a Fogo de Chão, you know Brazil loves its grilled meats, and you'll see plenty of multi-meat kebabs outside bars here. Wash them down with a cup of superfruit in the form of acai, but be sure to ask for a small or else you'll end up with a bowl as big as your head. Doner kebab might be Turkey's greatest export (or Germany's greatest innovation depending on who you ask), but there's plenty more to the streets of the city formerly known as Constantinople (been a long time gone, Constantinople). Istanbul's close relationship with their neighboring seas is evident in balik ekmek sandwiches, which top a grilled filet of mackerel with greens, onions, and a squeeze of lemon. More fruit of the sea comes in the form of rice-stuffed mussels, while those looking for a funkier meat might turn to kokoreç, aka spitted lamb intestines. Then there are the equivalent of dollar slices, a thin-dough pizza called lahmacun that's spread with a mix of minced beef, lamb, and peppers that you roll up and stuff into your face. This would've placed higher if Berlin didn't have the doner kebab game on lock. Iceland might not be known as a street-food mecca, but they've got one secret weapon that earned them a solid place on this list. 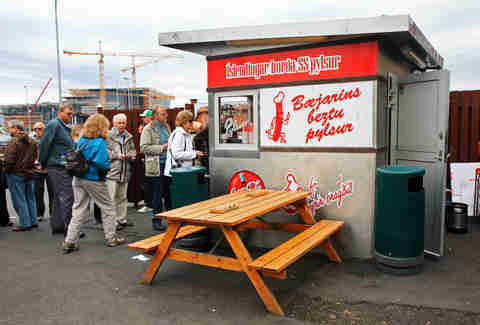 It's Bæjarins Beztu Pylsur, which translates roughly to "the best hot dogs in the universe," a distinction not only noted by its sign, but also by the Michelin Guide. It's common lore that every Icelander has eaten one, as well as some famous American gluttons like Bill Clinton and Anthony Bourdain. Part of the secret is a small amount of free-range lamb, as well as crispy fried onions and a stripe of remoulade. Sure, it's just a hot dog. And a space shuttle is just a plane. You could make a case for New York’s hot dogs, halal carts, and street meat, or Chicago’s dragged-through-the-garden red hots, but Portland has so embraced the concept of street food that it’s become a way of life. 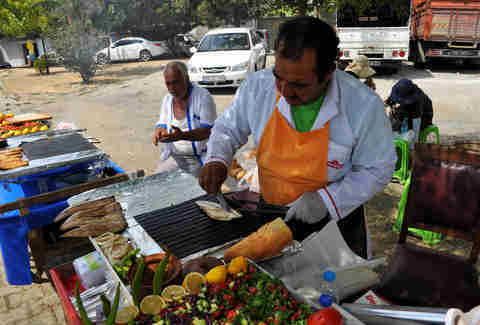 It helps, too, that most of the hundreds (estimates range from 400-700 operating on any given day) of food carts out there aren’t limited to slinging meats simmering in dirty water or roasting on an exposed spit for days. In fact, Portland’s street-food scene is like a staging ground for the restaurants of the future, as evidenced by numerous carts that worked out their culinary kinks before opening great restaurants. The carts are often clustered together in “pods,” where there’s often beer and sometimes cocktails. And the variety of foods on offer is astoundingly diverse. Where else can you get a foie gras burger, Ethiopian food, steak frites, lobster rolls, lesser-known Thai delicacies, octopus balls, burritos, fried pies, pasta, cake, cheese plates, Mauritian curry, wood-fired pizza, hand-churned ice cream, poutine, porchetta, tandoori chicken, arepas, sushi, or a waffle cone stuffed with pulled pork all in one neighborhood (and for under $10)? Oh, and if you really, really need some halal food, street meat, or a Chicago dog, well, they’ve got those too. Black, green, gold, and more green may be the colors of the Jamaican flag, but jerk is the undisputed color of the chicken. Charcoal is king, and its queen is long sticks of green pimento wood that instill a signature smoky flavor that complements the all-spice and Scotch bonnet pepper rub. Expect a side of rice and peas, and maybe a cup of oxtail stew. 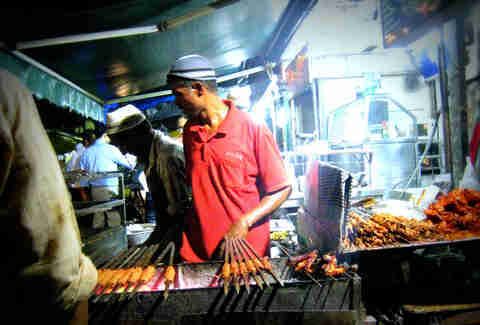 You'll also find crazy-good curries, sweetened bread called "festival" that's a common late-night snack for its ability to right a stomach full of rum, and super-savory beef patties. There's also a surprising thread of Asian flavors showing up in the form of sichuan-style chicken dishes reggae'd up with the same Scotch pepper you'll taste in the jerk. Kingston earns bonus points for the fact that all of this is eaten with a side of tropical climate and reggae music. 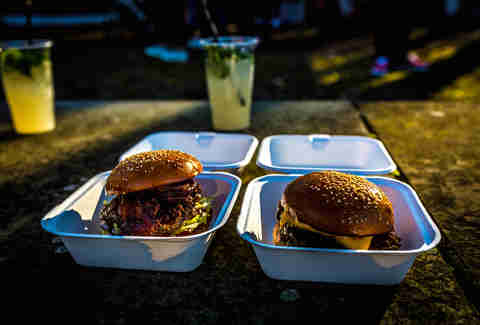 Known for: Jerk and curried chicken, oxtail stew, sweetened bread called "festival"
When you consider that the most popular British-invented dish is chicken tikka masala, it comes as no surprise that London's street food follows a similar route of adopting food cultures, then sternly-but-lovingly raising them on homegrown produce. The various markets (and more recently, food trucks) are lined with stalls from virtually every nation under the sun, slinging spice-fueled tacos, juicy brats, steaming bowls of pho, packed lobster rolls, and more -- and the packed crowds of tourists & locals alike attest to their quality. Tokyo would place higher if there wasn't a stigma against eating on the move, but that doesn't stop them from having two massive outdoor eating amenities: next-level vending machines and the Tsukiji market. Just the fact that you can score a beer out of a vending machine takes Tokyo up our list a few places, but the true gem is Tsukiji, which very roughly translates to "seafood heaven." Sashimi samples, raw oysters, and massive nigiri rolls are all incredible. Despite the street-eating stigma, any time a festival is going on you'll find an army of vendors slinging the best pancakes in the world. 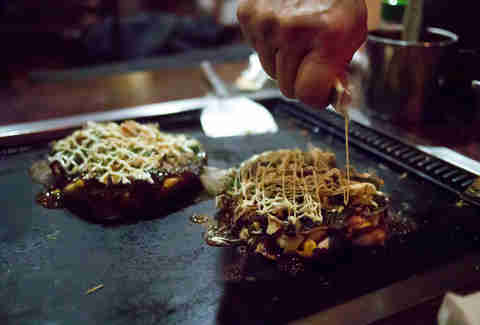 Or go simple, by waiting alongside a busy line of Tokyo businessmen for a bento box. The world is in a deep debt to Berlin for popularizing the doner kebab, and the world is also in deep debt to Berlin for keeping the euro somewhat competitive with the dollar, am I right? 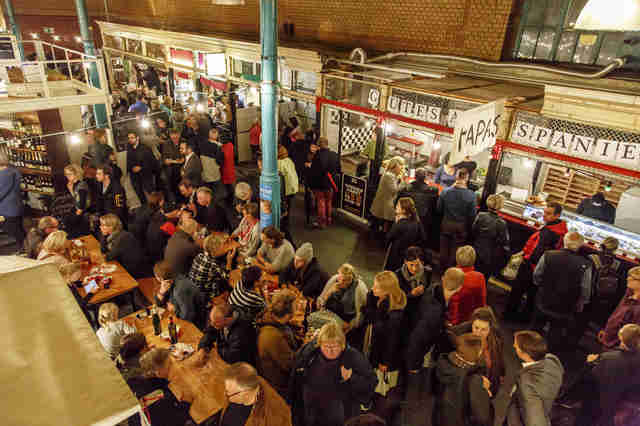 Economics asides aside, few things taste like classic Berlin like currywurst, and a fresh pretzel is a must to soak up all the beer, but what the city excels at these days is pushing the envelope. That's where these 10 food trucks come into play. 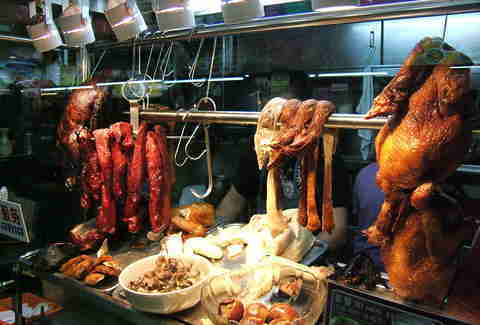 If Shanghai food hawkers only sold dumplings, they'd still be in this ranking. From fried to steamed to soup-filled, the dumpling is a near-perfect vessel for scalding-hot pork. Their close cousin the potsticker is also popular, along with an equally diverse selection of buns. With scallion pancakes you can have breakfast any time of day, abundant seafood options like skewered octopus or spicy chili crawfish are lighter alternatives to kebabs and crispy fried chicken, and for the very bravest of souls, the stinky tofu is not to be missed. It's hard to turn down a good samosa, and it's even harder when there's a near-endless amount of varieties. Mumbai's famed street-food lanes known as khau gallis are teeming with fried chaat, and samosas of all sizes, shapes, and stuffings. Kebabs (with naan) may be the most ubiquitous meat, and range from well-known proteins like chicken tandoori to rarities like grilled cow udders, but the most popular dish is not-surprisingly vegetarian: a potato fritter sandwich called vada pav that's topped with either red or green chutney. The sheer breadth of mouth-watering grilled meats available in the top-five cities keep Mumbai out of that stratified air, but there's still plenty to love here. When night falls, the Jemaa el-Fna square becomes one huge outdoor cafeteria, without those mean kids in high school who said you couldn't sit with them. Like anywhere in Morocco, the locals are relentlessly friendly and a chorus of "my friend, where are you from?" 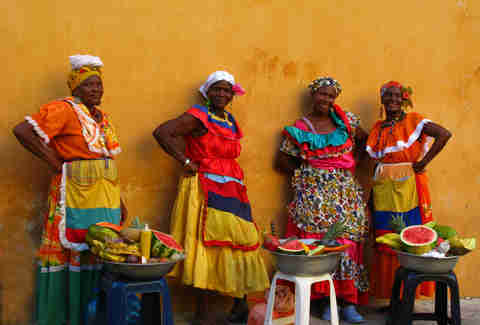 reverberates from most stalls, but thankfully they're selling goods much more delicious than leather sandals and rugs. 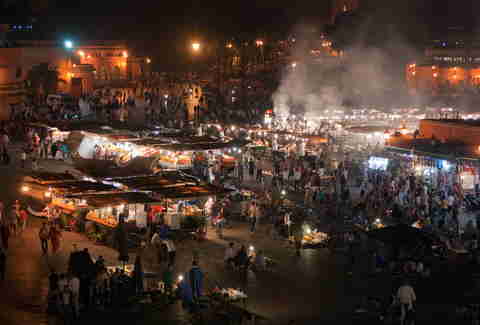 The lantern-lit square is like an open-air sauna of spice, bathing everyone in the rich smell of cumin and turmeric. Sausages hang like Christmas lights, earthen pots hide steamy tagine, and more exotic fare like fried sardines and unusual cuts of meat are as ubiquitous as mint tea. Marrakesh might've jumped another spot or two if it was easier to find alcohol to wash it all down with. Stateside Vietnamese cuisine is all bánh mì and pho, which alone would make Ho Chi Minh City a must-eat destination, but the streets of Ho Chi Minh City are paved with more than beef broth and French bread. From sprawling markets to sidewalk stands, the food of Ho Chi Minh City is a mosaic of savory soups, fired meats, and fried crustaceans. Naturally, beef broth pho is huge, with chicken broth just as widely available. 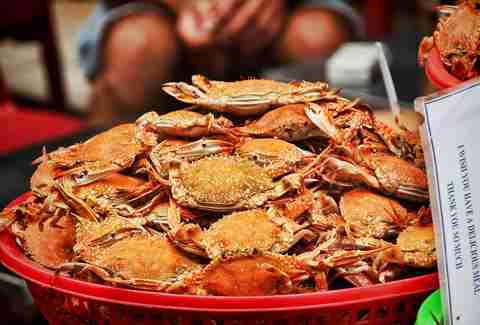 Crabs range from sitr-fried with tamarind to soupified with thick udon-esque noodles in bánh canh cua. And while bánh mì flourishes, don't sleep on the city's turmeric-loaded bánh xèo crispy pancakes. Mexican food sometimes gets flack for just recombining the same ingredients in different ways, but that only serves to buttress its ability to create some of the greatest street food known to man. 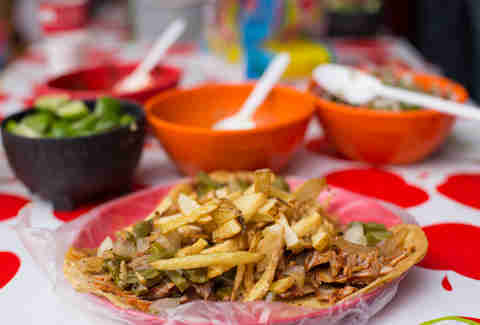 At any hour of the day you can find street corners crowded with Mexicans huddling around a cart with a flat grill frying up meats to fold into fresh tortillas. Or see a sizzling circular pit of meats stewing for the next order. 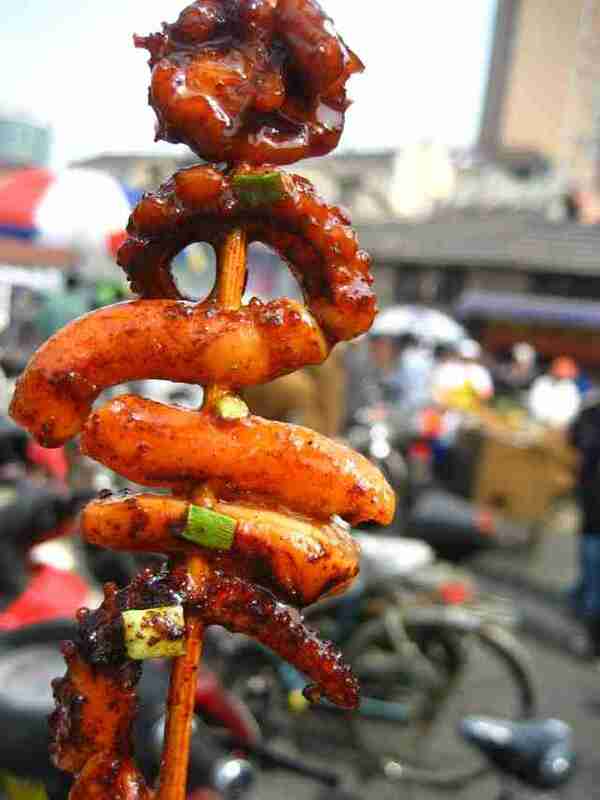 Or whole blocks lined with spinning al pastor or rotisserie chicken. You could go a month without eating a single veggie other than onion and cilantro, but those deficiencies are combated by the plethora of stands slinging freshly squeezed juice, cups of mango powdered with savory chile, and mayo-slicked corn on the cob. Sugary churros, fresh pastries, or steaming-hot tamales have you covered in the morning. Although it's mostly traditional Mexican, less-conventional ethnic food trucks are also starting to make their mark on the scene, although the jury's still out on whether or not to trust Mexico City street sushi. Sure, you'll find the best pad Thai of your life, but the streets of Bangkok are paved with more than just stir-fried noodles. Roasted chickens and ducks hang from carts, bountiful papaya salads serve as some much-needed veggies, and basically any protein you can imagine is fried up and satayed. Literal buffets of curry line the streets. The seafood game is on point with everything from fried-to-a-crisp mussels to barbecued catfish to live "dancing" miniature shrimp. Super-heavy meals like deep-fried pork belly are contrasted by lighter fare like sour tom yum soup. Expect mounds of basil, garlic, and chiles on top of everything, and plenty of sticky mango rice to combat the heat from those same chiles. It's impossible to do justice to the massive scope of the offerings here, and the complexity of those flavors helps push Bangkok to the number two spot on our list. You thought Singapore was a country? Turns out there's some serious debate about that. But since it's often referred to as a city-state, that sounds like it can be classified as a city to us. No matter what you call it, Singapore has an incredible food scene. Eating street food is always a gamble, but Singapore takes our top spot partially because they offer some of the safest cheap eats in the world thanks to the government organizing street-food vendors into regulated hawker centers. The relative impunity offered by these health standards means you can double down on fish dumplings without fear, tear out the eyeballs of curried fish heads with reckless abandon, and slurp star anise-scented pork rib soup until your heart is content. Some call chili crab the national dish, others say Hainanese chicken rice, but if you've got a massive garlic tiger prawn in your mouth, it'd be hard to argue against that. Wontons, oyster omelets, and all-duck everything. Singapore even knows how to make stingray taste good (a heavy dose of sambal). And (gasp!) durian. 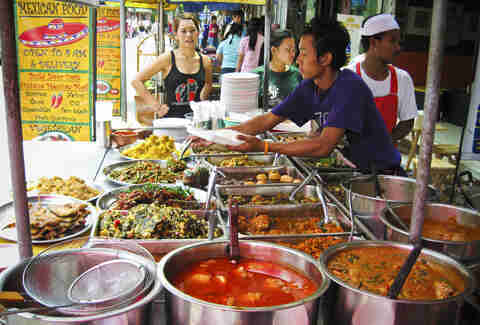 If you walk down the right street at the right time in any of these cities you could make a case for them being the best in the world, but Singapore's massive scope, creativity, breadth of dishes available, and the fact that you can devour all this stuff with relative sanitary confidence earns them the title of best street-food city in the world. Dan Gentile is a staff writer on Thrillist's National Food and Drink team. He apologizes that he missed that one stall on a side-street in whatever town you studied abroad in that had the best food. The BEST. Also, he died a little bit when he put Portland on this list instead of Austin. Follow him to all-Texas, all the time at @Dannosphere.